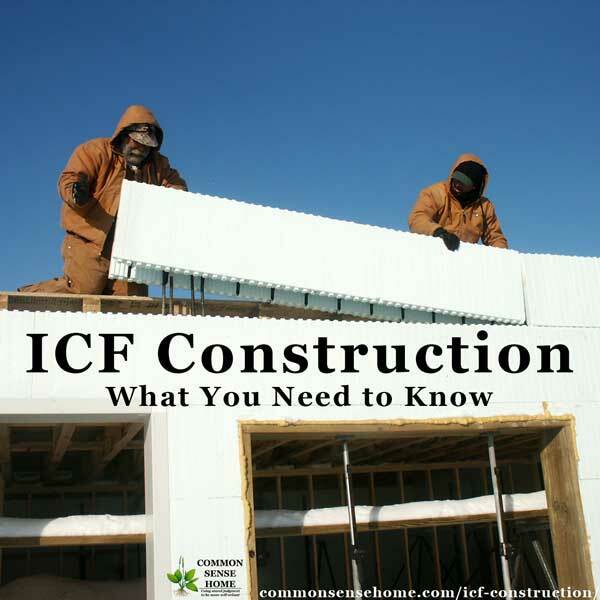 What is ICF (Insulated Concrete Forms)? 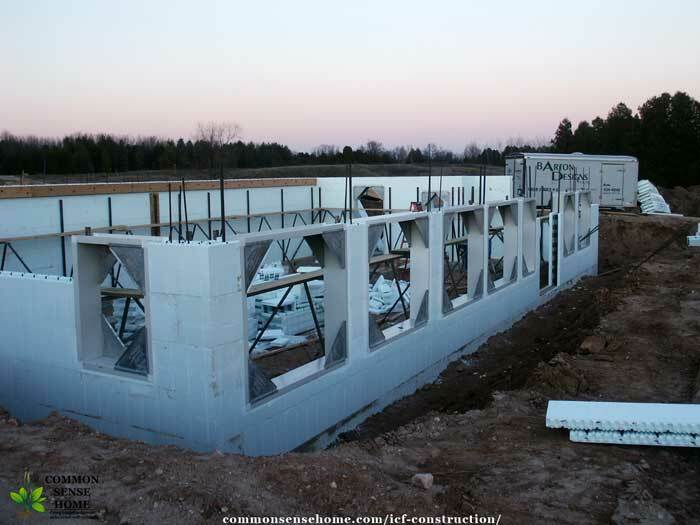 ICF (Insulated Concrete Forms) are premade forms that fit together like legos or large interlocking blocks. The outside of the form is flat sheets of foam insulation. These sheets are connected with plastic framework. During construction, the ICF blocks are fitted together, laced with rebar, and filled with concrete. The forms are insulated on the inside and the outside, providing high level of wall insulation uncommon in standard home construction. Because the ICF blocks fit together virtually seamlessly, there is very little air infiltration, increasing the effective insulation value. The forms we used to build our house consisted of two layers of insulating foam approximately 2 inches thick, inside and out. The rigid insulation sandwiches a 6 inch thick layer of concrete. The Insulated Concrete Blocks measure roughly 16 inches tall by four feet long by 12 inches wide. They have an inner and outer plastic framework in the forms that stabilizes the form and provides strips that can be drilled into to mount drywall, cabinets, wood trim, and siding on the outside. 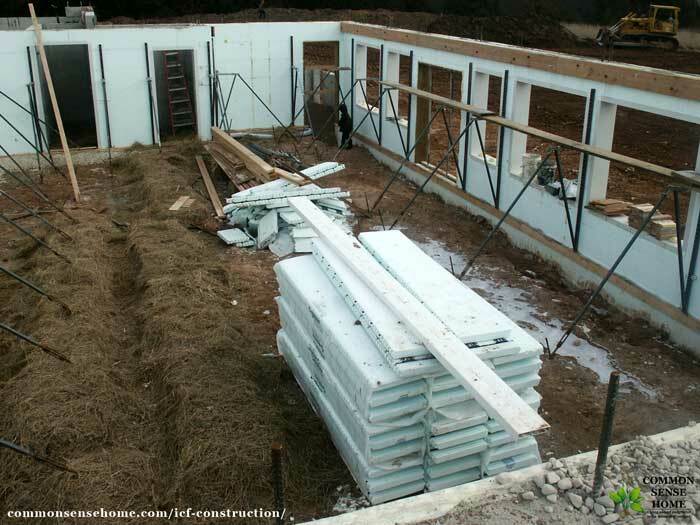 ICF can be used for basements, underground homes or entire multi-story homes. They can start at the foundation and go all the way to the roofline, as in our construction. Some builders use only insulated concrete foundation forms and combine them with other building methods above ground. One of the primary reasons we chose Insulated Concrete Form construction was for its energy efficiency. Because the walls are uniformly insulated with a solid sheet of foam inside and out, there are no channels for air to seep through. 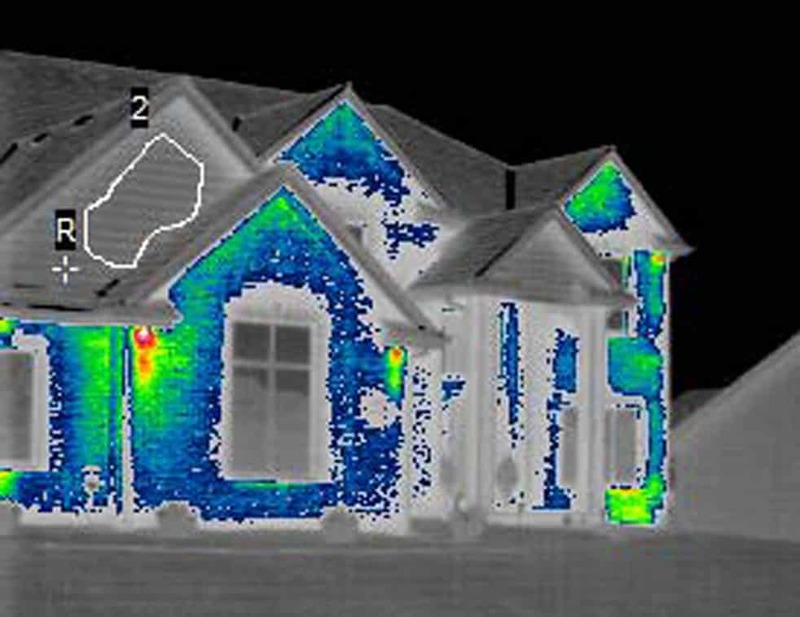 You will not find hot and cold spots on an ICF wall. In stick built construction, your effective r-value is greatly diminished by air infiltration and heat transfer along wooden studs and around outlets and other wall penetrations where the fiberglass insulation does not fill the area completely (spray foam insulation is better, but you still have heat transfer along the studs). 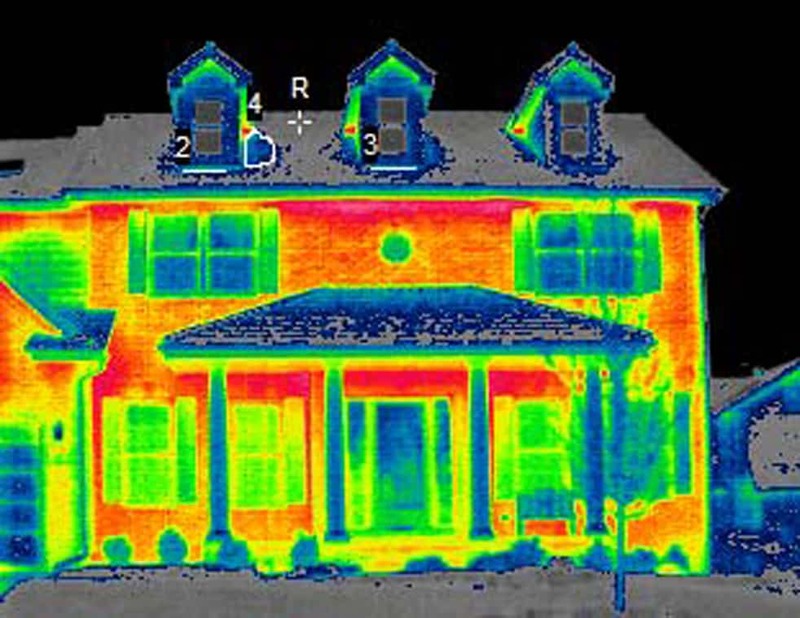 Thermal images courtesy of Reward Wall Systems. The amount of concrete used in the structure gives the home high thermal mass. This means that is holds temperature very well. Heat it up, and it stays warm – you don’t lose heat to the surroundings. Fill the house with cool night air in the summer and close it up during the day, and it stays cool. Windows at the east and west ends of the home allow us to take advantage of winds off Lake Michigan to flush warm air out of the home. When I ran the numbers on our home, our energy use rates (heating, AC and electricity) placed us in the top 5% of homes in the US is terms of efficiency for square footage. These are my own rough estimates based on utility bills and wood use. My best estimate is that in an average year we get 10% of our heat from passive solar, 40% from wood and 50% from propane via our in floor radiant heating system. We were able to provide all our hot water and heat over 3000 sq.ft. of living space with a 46 gallon Combi-Cor water heater. (Combi-Cor heater is a water heater with built in heat exchanger for space heating.) In 2013 our Combi-Cor died. We replaced the Combi-Cor water heater with a boiler system because it has a longer estimated lifespan. Windows are placed to maximize cross ventilation when weather permits. The house is exceptionally airtight, so we also installed a Fantech HRV (Heat Recovery Ventilator). An HRV brings outdoor air inside and preheats it with stale indoor air before it enters the home – fresh air in, stale air out. The HRV could also be fitted with specialized filters to address toxic air problems outside the home. During extremely humid weather, we do have some minor condensation/mildew in the basement if I don’t keep the air moving. In floor radiant heating eliminates this in cooler weather. A quick google search of “ICF hurricane proof” or “ICF tornado resistant” will yield dozens of images of ICF homes left intact in area where the surrounding homes have been leveled. Note: Around 1 am on August 7, 2013, a tornado touched down within 5 miles of our home. Inside our ICF home, the storm sounded very much the same as a typical thunderstorm, although I did note that the thunder had an odd tone to it – that low “freight train” rumble you hear people talk about. The warning sirens never went off, and we stayed in bed. I had no idea there was a tornado nearby until the next day. There was no damage to the house at all, but it's a disconcerting feeling to know that the funnel hit so close without us realizing it. I think the weather radio needs to live in the master bedroom. While the contents of the home are still flammable, concrete itself is not. You have no chance of an electrical fire being concealed inside a concrete wall. Concrete can stop all kinds of radiation, including alpha, beta and gamma rays. There’s a reason that nuclear containment vessels are built out of concrete. With additional reinforcement appropriate to the level of seismic activity in your area, ICF construction is highly resistant to earthquakes and other shifts. 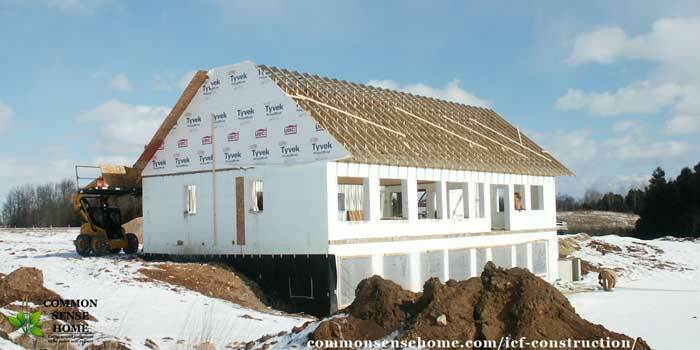 At the time that we built, our builder estimated that ICF homes cost about 6% more than stick built. Part of this is the cost of the materials themselves, part of the cost is additional labor involved in working with some aspects of ICF. This is likely to vary over time as material costs fluctuate. Some ICF manufacturers offer discounts on forms to those who are rebuilding homes destroyed by storms in officially declared Federal disaster areas. As for finding a builder who was familiar with ICF, that was a little tough. At the time that we built, it was a newer technology. Now that its benefits become better known, it’s becoming more widely used, especially in areas that are prone to tornadoes or hurricanes (more on that in a bit). There was no difficulty in obtaining financing or special permitting required, as the use of ICFs is an approved building method. As mentioned at the start of the post, the concrete forms are assembled, Lego-style, laced with rebar, and then filled with concrete. Because the concrete and rebar provide the strength of the wall – not the form – temporary framing is used during the pour. Our home uses these forms from the foundation to the roofline. Other options are basement/foundation only, or for building/retrofitting a safe room within the shell of a home. Looking down into the basement from above. Note the stacks of ICF forms and extensive bracing against the walls. 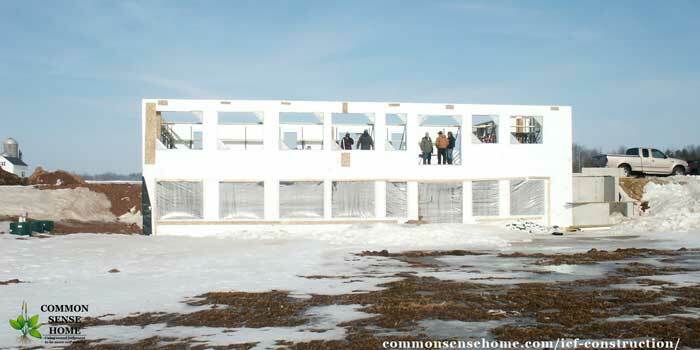 A wall is framed out with the ICF forms, V-buck openings, and bracing, and then poured in “lifts”. Rebar is set inside the forms and tied. Windows and doors are framed using “bucks” (box outs that create a frame for a window to fit inside. Here we see the south facing wall of the basement with windows framed and braced. 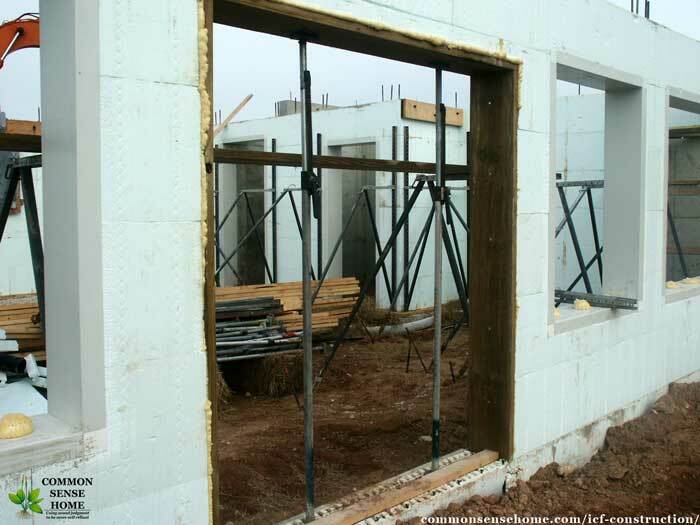 Door and window openings in an ICF home under construction. Note blobs of spray foam insulation in bottom of window frames. Plumbing and electrical must be done a little differently than with a stick built home. It's much easier to plan any wall perforations in advance than to cut them after the fact. Electrical wiring on exterior walls is done by cutting into the insulation, laying the wire, and then sealing the cut with spray foam insulation and trimming flush. Plumbing on the exterior walls can be done in the same way, but is generally avoided. Inside, the framing, trusses, etc, are the same as in a conventional home, although we did use open trusses to facilitate the installation of ductwork and radiant heating coils under the floor. 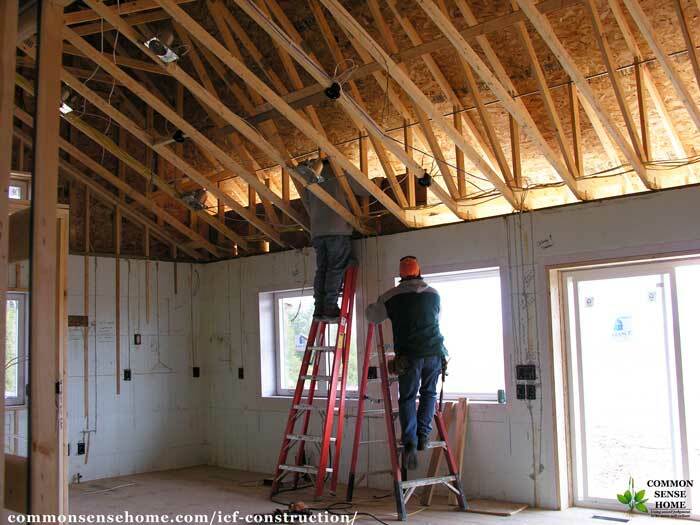 Here you can see the crew working in the kitchen, adding framing in the attic area. If you look closely, you can see the channels cut to the electrical boxes. 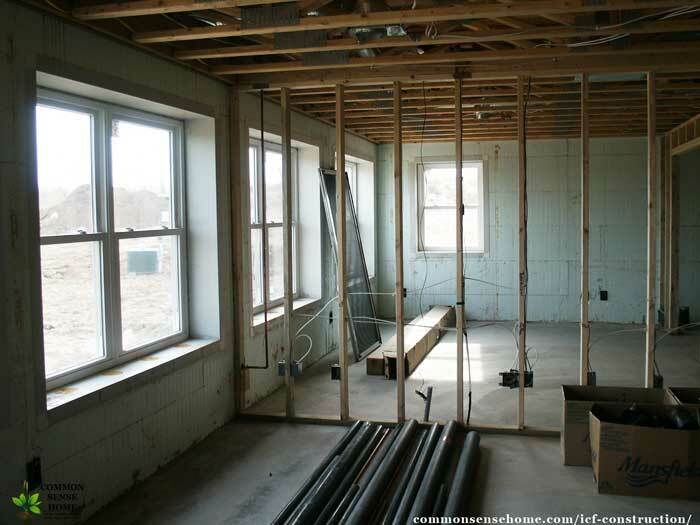 Drywall is screwed into plastic strips in the ICF forms, allowing the home to be plastered and finished like a conventional home. There are no ugly, bare concrete walls. The only indication you have from inside that the house is not standard construction are the deep window wells and doorways. 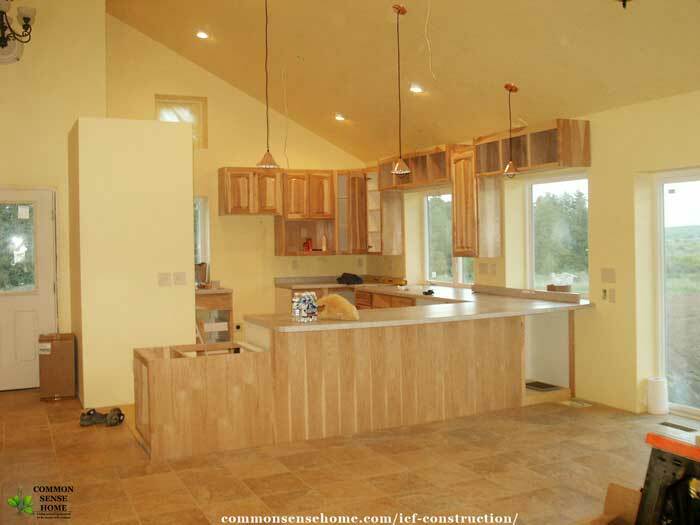 Here's another view of the kitchen, later in construction with the cabinet frames, flooring and lighting in place. The look and functionality of the home is similar to a standard home, only better. (I may be biased. ;-)) The interior and exterior can be finished in the same way as a conventional home – siding, brick, drywall, paint, carpets, etc. In our case, we chose to use all hard surface flooring on the main floor and acid stained concrete in the basement to maximize the heat transfer from the in floor radiant heating and improve indoor air quality. Our home is certified Wisconsin Green Built and Energy Star compliant. We utilized no and low-VOC materials and finishes within the home; sustainably harvested hickory and wheat board for our cabinets and shelving; green flooring such as tile, cork and linoleum – I could go on, but you get the idea. About the only thing that is a little tricky is hanging things on the exterior walls, because there are no studs and the stripping is hard to find under the paint and drywall. I use removable adhesive tabs instead. I would not recommend do it yourself ICF construction for the average handy person. It can be done, but you need special equipment and you don't want to screw up. Walls and openings must be well braced to maintain structural integrity. You only get one chance to pour it right and it can’t be adjusted after the fact. Dedicated ICF builders have specialized braces for this purpose, and know how to work with the forms to avoid problems. Also, the cement mix must have just the right consistency. Too loose, and you risk blowing out a wall. Too thick, and you’ll end up with air pockets in the wall because the cement has trouble filling the forms completely. If you are on an extremely tight budget, and ICF safe room is probably a better choice. A safe room is a small, windowless room built inside the shell of the home or garage or nearby, that is used primarily for emergency shelter. View inside the basement with windows, framing, plumbing and electrical in place. The home is very quiet. The noise reduction from the ICF is noticeable to anyone who visits. We've been in the house over 12 years now, and it's holding up extremely well. Several people who came to last year's open house noted that the home didn't look 12 years old. Our heating and cooling bills are still low, and I would definitely recommend ICF construction. Our assistant construction crew, playing on the job site while the house was being built. You need plenty of ventilation because the home will be so tight. Don’t count on natural convection (normal heat/cold airflow) to move air around the house. You will need point source ventilation and an HRV or ERV with ICF construction. Make sure you get a builder who has worked with ICF before. It is not the same as a stick built home. Windows and doors must be exact – you can't cut a wall and add a stud like you can with stick built. Windows and sills must tolerate wider temperature swings and condensation if you use insulating window covers. Make all window sills tile or other water resistant material. Since our home uses passive solar design, large windows are needed. These must be covered at night to avoid excess heat loss. Covered windows + tight home = condensation. I’ve taken to applying a layer of insulating window plastic on the inside of the north windows at the beginning of the heating season. (In retrospect, we should have probably upgraded to the triple pane windows with argon fill on the north side of the house, instead of a good quality double pane.) Our window frames are vinyl to reduce heat loss from the home and prevent rot. Here are two stacks of the v-buck window frames used with the ICF forms. Note the thickness of the frames to match the thickness of the ICF walls. Learn more about green home building and sustainable living on the Green Home page. My husband and I are also working on a book detailing our building experience and offering guidance for building a “lifetime home”. If you'd like to receive information on when the book is available or have any questions/concerns you'd like addressed, leave a comment below. Originally published in 2012, updated in 2018. Love this post! Very interesting. My uncle is a contractor and built one of these homes for himself (although he did not keep it). Will you be talking about how this compares to other unconventional homes? Such as straw-bale construction? Sarah – not in these two posts, but perhaps at some point in the future, especially if I can get a straw bale person to weigh in. I prefer first hand experience when possible. Had any problems with mold? Love the idea of ICFs, but wonder about mold getting in between the forms and poured concrete . . .
On the mold comment ICFs actually help in reducing risks of mold. Remember what mold eats- organic material. Mold wont eat foam and mold won’t eat concrete. Mold could eat the drywall or the trim or the wall paper, but that’s the another great thing to ICF as well. Rip down the wall paper, remove the drywall, wash the foam wall behind it down and then replace with new drywall. Mold problems solved. Do you have a rough sketch of the plans you could post? I’ll be posting more house information, including drawings, in upcoming articles. Hi Laurie… Love all the info you provide on your website. I would love to share some of the articles with my followers on facebook … if you don’t mind? You have written extensively about root cellaring with photos! 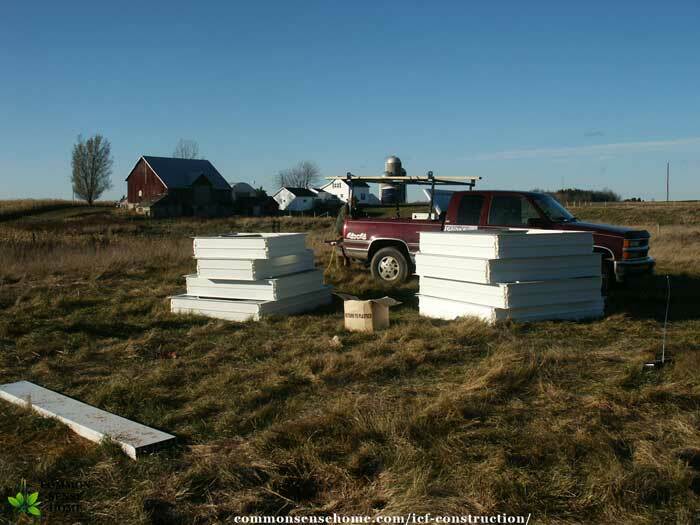 I do have one question… on the ICF walls for your home, isn’t the foam form like heavy duty styrofoam? And if so, what about during warm weather where styrofoam can gas off formaldehyde? Do you have any info on this? As a Wisconsin Certified Green Built Home, part of the requirements our builder needed to meet was the use of low or no VOC materials. I don’t have the specs for the ICF close at hand, but I know that this was part of the certification. It did come up in discussion of other materials, such as the particleboard,cabinets and other insulation. There has never been the typical “new house smell” indicating outgassing of VOCs, even in the first summer when it was very hot and humid. Given the tightness of an ICF home, outgassing would be a real issue if it occurred, even without the additional Green Built certification. Yes, you may share links to posts and post snippets, as long as credit is given. I’m living in an ICF house also and was very interested in your article, especially your comments about condensation. The one (big) problem I’ve had is with the windows. At first I had all aluminum storefront with a thermal break. The condensation in the winter was so bad I’d get up to 1/4″ of ice on the aluminum sills. I had all of them replaced with Aluminum Curtainwall which has a higher condensation resistance factor. I still have issues, especially at the beginning of the heating season. These storefront and curtainwall systems are used throughout this area with no problems. The one difference I can see is my ICF construction. I don’t know why this is true. I’ve searched the internet for answers and haven’t found any. On the up-side: My energy bills are very low and here in tornado country I’m happy for the extra protection. Since the walls are largely impenetrable, the only thermal pathway left is through the windows. We choose vinyl windows because of this (lower thermal conductivity), with v-buck framing. All windows are covered with double honeycomb cellular shades at night and opened during the day. If there’s sun, the condensation will clear on the south side. With extended lack of sun, i wipe up condensation with an old towel. On the north and west sides, once it gets cold, I add an additional layer of clear plastic to the windows. I get some condensation, but not nearly as much – nothing more than a few drips, unless it gets bitterly cold. We will start building a ICF house in June 2014. We have a experienced architect and builder. We live in Missouri where winters can be below zero and summers can be over 105 degrees. I know you are not a builder but I respect your opinion since you are already living in a ICF home. Our builder is guiding us to electric baseboard heating since the house will be so efficient with radiant floor heat in the basement–in your opinion will this be enough to heat a 2300 square foot house? Of course we will have a air conditioner. With the blower from the inside air conditioner unit will we need a heat recovery ventilator for air quality also? Also if you had to do it over again what do you wish you would of included in your home? Thanks in advance!!! Love your blog! Yes, electric baseboard heat would most likely carry the load, but I’m not sure about lifetime costs versus installation costs. Around here our electric rates have gone up every single year we’ve lived here. I haven’t lived outside of Wisconsin, but I suspect humidity might be your biggest challenge. If you don’t opt for an HRV or ERV, make sure that you have high quality spot ventilation in the bathrooms, kitchen and laundry. Placing the stove and dryer on outside walls to minimize the distance air needs to travel to get outside will increase efficiency. I am probably going to build but with AAC. Thanks for the tips on the windows. However, George Swanson, a guru of environmentally safe homes, doesn’t like icf because he has found mold or bacterial overgrowth in the concrete due to the fact the foam is not breathable. Walls need to be waterproof but breathable. Anyway, we just tripped on a poured concrete house like yours w icf and do like it. Wondering whether its safe for us to buy and not build our own. I don’t like the icf for lack of breath ability. Concrete definitely can get other organisms besides mold. However the house seems utterly mold free (I’m sensitive and always react). Will do a voc analysis anyway. My bigger concern and chagrin is that his subcontractors insisted on wrapping the whole structure in tyvek. We are in Georgia. I guess they don’t understand concrete homes. He protested but they said sorry that’s code. Tyvek stops breathing at all after a few years. Tyvek is a bad deal. Do you have any thoughts about longterm consequences and how I can estimate potential issues? I will go look at your links. My building consultant agrees its a drag the house is now not breathable but thinks a really good redo of hvac with hepa and ERVS would mostly protect us, add another 10k to cost for me tho. If you choose to buy it, I’d definitely opt for the HEPA and ERV. I think it’s crazy that they had to tyvek the house for code. Our house has been fine for nearly a decade – until this year. We had a record setting winter last year in terms of snow and cold; a cold, wet spring, and a wet, cool fall – really wet – but not really cold enough to turn on the heat. We had a sudden bloom of mold and mildew growth in some areas of the basement that I’ve been working to completely eliminate since. Yeah, I tend to think the subs were just stupid and used to conventional houses–and if he’d insisted they stop right then, he could’ve gotten approval from the county. I really can’t imagine it’s code to use tyvek on poured concrete–and I’m going to call *my* county where I bought property to be sure I don’t run into the same problem. Definitely will do an ERV and hepa–have a redesign of the hvac by my guy. Basements are notorious–soil has so much moisture. They originally were root cellars that people lived in while they set up a garden, got animals, got to know their land, and then built a house (as far as I know.) I think basements are really a bad idea. Build out or up, not down into the moist dark soil. 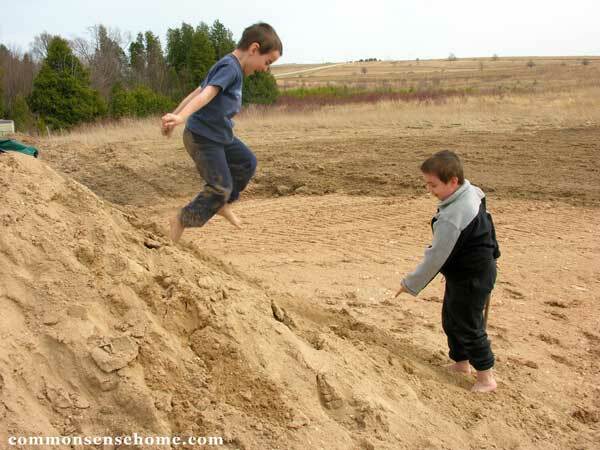 If I build, I’m going to pack sand before I lay a slab, and there are other things you can do to stop soil moisture from wicking up the concrete. But I am sure you’ll solve your problem. I’d get sick from that bloom. I really do like the house…I’m sorely tempted, and I could use the new fannie mae 3% down and 3% interest that began on Dec 8, making my monthly cost very reasonable. But the house is overpriced for the area of course, on the assumption somebody will want it for the materials and construction. Earth sheltering has been around for more than basements for a very long time because of the awesome protection from the elements – but it does come at a price. In our climate, basements are standard, and do offer living space that’s protected from the cold, which is really important for many months of the year. We do have a sand bed under our slab, and a moisture barrier, and heat in the floor itself – but it’s been record setting weather, and I tried to manage with natural ventilation when I should have used the HRV more. Live and learn. We don’t spend much time in the room with the bloom – which is how it went unnoticed for a while – but I think with cleaning, ventilation and the space being heated for several more months, it’ll be okay. We ran into bad luck in terms of when we built. It was during the boom years, so house prices were maxed out. Now we’d be lucky if we were able to sell for what we still owe. I hope that whatever you end up doing, you get the house you need – and no mold! My wife and I built a custom home in Ontario Canada where we have a four season climate! We chose ICF and built from the footings to the roof trusses! The house is 2,100 sq. ft on the main floor and 2.100sq. ft. Basement. The 2 acres we built on is all sand hence no drainage problems we put weeping tile around the footings which go to a sump pump in our basement which also collects condensate water from the boiler for our hydronic in floor basement heat and condensate from our gas fired furnace which rarely runs in the winter but runs in the summer for our air conditioning then we pump the water out to our flower gardens! The contractor wrapped the basement with a heavy waterproof Dimple wrap to keep water away from and to protect the styrofoam and then parging was applied blending and finishing up to the brick ledge then we back filled with the same sand that we excavated for the basement! The house is stoned all the way up to the roof at the front and five feet up the wall on the other three sides with a sandstone ledge. Above the ledge we strapped the walls then put typar over the strapping then covered with vertical vinyl siding which gave an air space to avoid moisture! We have been in the house 2 years with absolutely no condensate problems with the exeption of some condensation on the bottom of the windows on extremely cold days! Now I am in the process of installing our HRV unit in the basement which I am sure will solve that small problem! Yes ICF does cost more than a house with a block or formed concrete basement and wood frame but the comfort and energy savings are significant! By code I was required to cover the internal basement walls with 1/2 ” drywall for a fire barrier and have had after 2 winters no mould or water problems that is why radiant heat is a must ! I have the thermostat in the basement on low during the summer to keep the system operating and keeps the floor comfortable as the basement cools down due to the AC ,this not costly but necessary as it is a living space used by Grandkids and friends! We are in farm country but close enough to have natural gas but all the same equipment I have will also convert to propane! Thank you for sharing your experience, Dave. Just make sure you have good air flow throughout the home. Ceiling fans and forced air ventilation keep things moving, an HRV or ERV can ventilate to the outside without losing all of your heat. When the mold and mildew appeared was it ONLY in the basement or did you find it in other areas of the home? Would eliminating a basement make more sense when building this type of home? It has shown up in the basement and on the windows when we use the cellular shades and condensation builds up on the window in the cold. I’d never build a home without a basement in our climate. After living in our home for ten years, I’d be very hesitant to build with ICF in a humid climate if I had mold sensitivity, because the house does not breathe well. Create an Air exchange . Research, and talk to water engineer or air Quality Engineers. Traditional house have always been built on the breathable concept . The keep water out . Then there is the moisture barrier? Keeps Moisture out ? Gases ? Moisture is humidity. The air itself , unless you live in a dry desert environment? Moisture likes to rise from under ^ houses . Then escape through pores in walls and ceilings. Opening. . (A breathable stick frame ). For mold , there are new biodegradable material mold treatments. Research . Do not use (Bleach.) it forms gases . Peroxide will and and is used , to eradicate mold . Living plants are recomented . You can use artificial light when needed . Certain lights can also heat and kill secific molds . You need to research and think out of box . The only (single)solution is a (Mixture of solutions)! I choose Plants First ! Create an invironment for the plants to thrive in ! You will thrive with them . PS. If you lock yourself into only one solution? You won’t find away out . Hi, I was wondering about ICF homes in Florida. Their are advantages to this type of building for storms but the mold issue could be a problem in that climate. Could you please outline the building features that could be added to make it a more resistant build to mold. Also could you list the types/brands of forms out their for contractors to use for construction. Are their any forms that use 4 inches of concrete. lastly if going below grade in Florida what are the costs of additional below grade construction features. Yes mold is definitely an issue with ICF or SIP (and any other very tight building). You need extra airflow (full size house fan with vents in all areas) and a air to air heat exchanger HRV/ERV is absolutely necessary (for southern homes the humidity would drive me toward recommending the ERV). As to the brand of forms, we don’t have a recommendation. And you would have to contact local Florida permitting agencies (and a general contractor) to get costs and details for below grade construction. We live in Wisconsin. I Have Two Home one made out of ICF and the other made out sticks. I cannot believe the Quality difference ones strong and temperature stable! 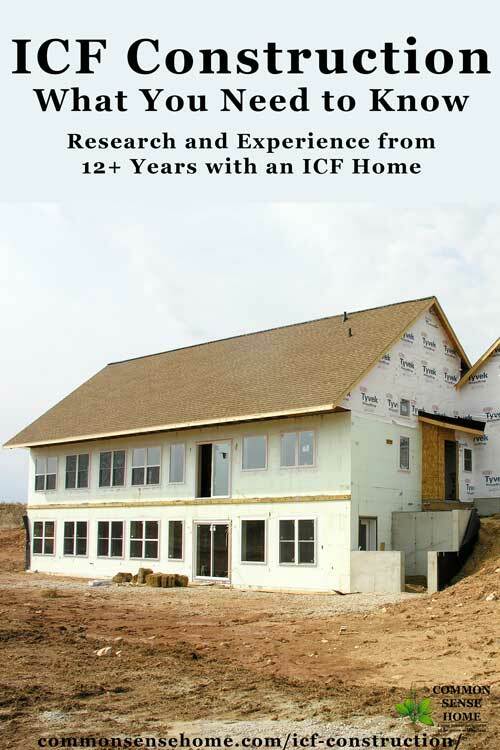 The icf home in fact survived a hurricane with minor only flashing damage at the roof line. Funny! I slept through the storm! On the other hand the stick built home is Noisy and drafty and not so stable. My wife calls the stick home A piece of you know what..She love her ICF home best. I was lucky the ICF home cost less for some reason..operational cost are 30% less…and the stick built home rated somewhere around 70 on the HERS rating.. Thanks for sharing your experience. I know the subcontractors around here aren’t used to working with many ICF homes, so I’m sure that was part of extra costs. Interesting questions and answers. We build an ICF house in2001,moved in in 2002. In addition to the house we installed an underground heat pump system that worked great. It worked as a heat or cool bank system. After the cooling season the water in the underground pipes would heat up to about 80 degrees, and we would start heating the house in the fall from that level, and when spring had come the water was cooled to about 36 degrees and we started cooling from the underground system with that degree. We had a walk-out down stairs and never had a mold problem. There is one huge regret we have about the house–we sold it after 14 years and moved to Texas. Where was your ICF located, in a more arid or more humid climate? We have a high water table here, so I’m sure that plays a role in the basement being prone to dampness. Our family moved from GA to WI in late 2013. We were fortunate to stumble into buying one of the few ICF-constructed homes in our immediate area with our move. The home we bought in WI has 4119 sq. ft. of finished floor level with the finished main floor level of about 2700 sq. ft. and the remainder being finished basement. The 3-car attaché garage is also of ICF construction. This home was constructed as a Metropolitan Milwaukee Parade of Homes model in 2002. It has a single 60,000 BTU forced air furnace and one 3 ton AC unit. An air-to-air heat exchanger provides fresh air ventilation and humidity control. We have triple-glazed casement windows throughout and 24-inches of blown-in attic insulation. Our heating and air conditioning bills are about 60% of that for other homes in our subdivision despite the fact that our home is larger than most that I am comparing ours to. With ICF, we have great isolation from outdoor noises, have very few issues with insects and no issues with mice getting into our living space. For comfort and good humidity control, we keep our HVAC ventilation fan running full time. If we keep our garage doors closed except when leaving and returning, our garage does not freeze during cold winter months, even without space heating provided. We have very limited issues with winter humidity condensation on windows, even with the subzero days often affecting the area during winter months. With our good tight-fitting windows, we have no comfort issues with draftiness. ICF construction is clearly the way to go. I wish I had known about it sooner. If I had, I would have built my last two homes using this construction, it being well worth the extra cost in reduced energy consumption, security, quietness and comfort. The one we’re working on? Not yet. Aiming for sometime in 2019. He works fulltime outside the home, and we spend a large amount of time during the growing season raising and preserving food, plus the website work, so it’s a challenge to carve out time. I have a icf basement with outside walls dry walled, my question is do I have to frame again to be able to finish my basement because of running plumbing and cable and what not? You don’t necessarily need to frame. 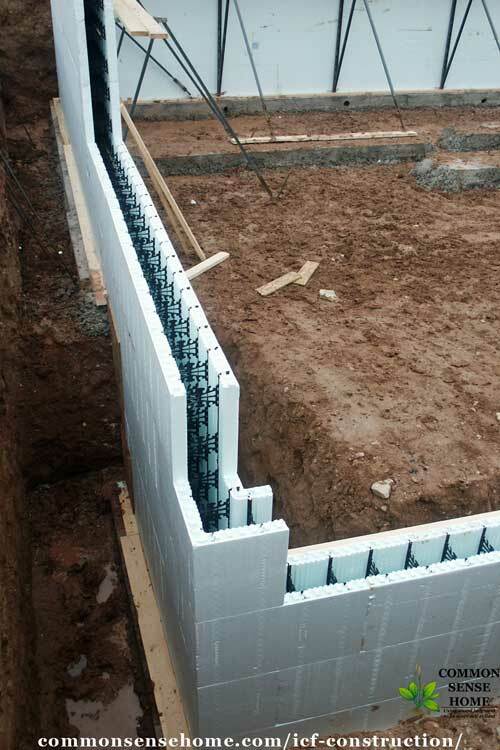 If a contractor is familiar with ICF they can cut into the drywall (and inside insulation) to create a channel. Our electricians used dull electric chain saws to cut into the insulation quickly to create channels then pushed in the cable and sealed the hole with spray foam insulation. The drywall would need to be patched and covered regardless, and you would lose a almost the stud space. The stud walls are a simpler solution. Hi. May I know how can you repair an ICF wall ? For example one of the piece of ICF is broke, how do you change it ? It depends on how it’s damaged. If something managed to damage the concrete, you repair the concrete, if the insulation is damaged you repair the insulation. When the walls are finished, it’s one solid unit of concrete laced with rebar. There are no longer individual blocks. I built an ICF home in 2008. I was the contractor and I and one other person did all the ICF layup and bracing. I went to school for 3 days and had no problem with the construction. This was the first home I ever built. I did my lifts 45 minutes apart and had no problem with blowouts. (One small blowout where a door opening was not properly reinforced.) I have been extremely happy with my home. During the pour I had several people watching the walls inside and out for blowouts. I’ve recently moved into an ICF house and have considered stripping back some of the poly on a small section of wall to expose the concrete on the inside. Have you heard of anyone having success with this? Why do you want to remove the insulation? We are looking into building an ICF home in the next few years for our retirement home. How do you find contractors who do this? I have been searching the internet but haven’t had much luck. If you can’t find anything online, I’d try asking around and visiting home expos, if there are any in your area. In most communities, someone knows someone in the building trades who can get the job done. I suggest asking ICF distributors for leads to contractors using their products in your area. So it’s either CBS or ICF for me. I found two contractors, and one has been more interested in my future project. We have kept in touch over the past few months, sent me pics of his most recent projects and he offered to show me homes he built in the Metro Area. All good signs of a contractor that’s proud of his work. However his quote is $125/sq. ft. It’s far from the 3%-5% that local stick builders have quoted with the plans I showed them. The stick builders quoted between $72-$85 per sq. ft. That should put me between $75.6-$89.25 per square foot with the industry standard 5% increase of ICF over stick. Even at 10% extra per square foot, it should keep me below my max per square foot price. My calculated budget is at a max of $100 per sq. ft. My plan is for about 2500 square feet. And to reduce the cost, there are some things I am willing to do such as flooring, painting etc. (Things I think I should communicate with him moving forward). I don’t want to resort to owner builder at the moment and I don’t want to have to resort to either buying a local stick built home or dealing with the stick builders I also got in touch with. What am I to do? My question is what was your per sq. ft. price for your home? I know it will vary from region to region, home plans and contractors. But don’t you think $125 is a bit much considering the plans are the same, and interior materials would be about the same? I don’t want to build a custom high end type home. Something fairly standard, with interior upgrades I will gradually update later on. I prefer a solid home over a good looking home that won’t stand a chance against the elements, and cost me more to heat and cool. Another question, where can I negotiate to lower the per sq. footage price? Unless you’re willing to become an owner/builder, odds are it will be tough to get your costs down beyond a certain point. Our builder told us up front to estimate that ICF would add around 10% over stick built, and I think we ended up a little higher than that because we had a number of custom features. It’s not just the cost of the ICF walls. When the crews are working inside, ICF changes how electrical and plumbing are run and surfaces are finished. They cut channels through the foam to run wiring, and the wiring has to be attached to the forms differently than just stapling it to studs, and then the channels have to be refoamed and trimmed. You can’t put plumbing in exterior walls. When they are hanging drywall, they have to make sure they hit the anchor strips in the ICF. The cabinet guys had a bear of a time finding the anchor strips in the finished exterior walls. Many contractors have a set team of contractors that they work with, and if you want to do those tasks instead, it cuts their team out of the loop and affects their bottom line. A good team works like a well oiled machine, and anything that changes that can cost them lost revenue on other jobs. Sorry I don’t have a “magic bullet”, but I encourage to talk with contractors and see if any are willing to work with you on this. We are looking to do the same as you. We have not hired anyone yet, but I have communicated with Dan of http://concretehomesga.com/ who said that most of their projects were coming in at $130.00 to $ 140.00 per sq. foot and that the the final cost of the project will depend on the individual plan and finishes chosen. Our feeling is that less space than we might ideally want, whether we use this builder or another, would be worth it, to have the long-term savings. Right now, we pay on average $400 a month for electric and sewer, plus termite insurance and have had many costly issues with our stick-built home (we did not build this one). I would be interested in who you are talking with, since both of us are in the preliminary phase. Dan was is one of the ICF contractors I mention. He must be busy. I haven’t heard back from him in days. His general quote was around $125 sq/ft. What other contractor(s) have you been in touch with? They’re not easy to find in GA. Please share any information you may have. It’s been very limited. I would settle for CBS construction if I cannot find ICF contractors at this point. They are in either South Ga or Tennessee. What other issues are you dealing with in your stick built home? As stated above, I am renting a home and notice many things that are not to my liking. However, this is temporary. But moving forward, this is not the type of house I want to live in. Please feel free to share other contractors you found.. IF THE OWNER OF THIS BLOG IS WILLING, I WOULD SHARE MY EMAIL ADDRESS WITH YOU, BUT DON’T WANT TO POST IT PUBLICLY. LAURIE, thank you for the opportunity to converse here. If you are willing to get in touch with me privately via email, you could pass mine on to GA ICF Dilemma or send his to me, either way. Thank you. Sarah – I’ll pass along your email to GA ICF Dilemma. The stick built price quote per square foot seemed low, but pricing may be different in your area. I have two questions. I’ve seen ICF work great up North. I now live in very humid Charleston, SC. Do ICF homes have any issues with mold or dampness in the very humid South? Also, considering I live in a hurricane prone area, are there better options than a truss roof i.e. a concrete roof to match the stability of the walls. Thanks. A third potential source of moisture is condensation. For the PCA condensation study, twelve climates throughout North America were selected, representing a wide range of climates, but with a bias towards those with known moisture problems. The study modeled all of the exterior and interior finishes described earlier, as well as the role of exterior vapor retarders and interior vapor-retarding paint. Also, the analyses indicated that an exterior vapor retarder is not recommended in hot and humid climates because it can potentially cause condensation within ICF walls. Technical experts with decades of ICF experience report that condensation is rarely a source of concern in the real-world. Kevin Rector, technical director at NUDURA, says that in his 15 years of providing ICF technical support across all the climate zones in North America, condensation has been an issue only once. The solution, again, was properly sizing the HVAC system. The EPS trade association is planning to collaborate with the Gypsum Association at some point to work up formal construction details for attachment of gypsum board to ICF. As long as the installer follows manufacturer-recommended detailing, the possibility of water infiltration is virtually zero. They’re constantly updating these details based on the latest science. The nine leading ICF manufacturers are currently working with the Canadian Ready Mixed Concrete Association to test which window buck systems best prevent water ingress. First round testing was completed in the fall of 2011, with further tests last summer. Final results are expected in the coming months. For mold or mildew to be able to grow, three conditions must be met. The first—that their spores must be present—is guaranteed, as it’s impossible to prevent them from traveling. The second item—humidity above 50%–has already been addressed. The third factor is the presence of a food source. ASTM C1338 (Standard Test Method for Determining Fungi Resistance of Insulation Materials and Facings) is the test criteria for mold growth. In 2004, generic ICF foam (regular 1.5 lb. rigid EPS) was tested by SGS US Testing Company, Inc., a trusted third-party laboratory. The results demonstrate that EPS will not support mold growth. In fact, of the five common indoor mold types tested (Aspergillus Niger, A. Versicolor, A. Flavus, Penicillium Funiculosum, and Chaetomium Globosum), the lab reported that there was zero traces of growth over the 28-day incubation period. Additionally, EPS foam’s resistance to mold or fungal growth is not due to any special additive. Unlike wood or drywall which is treated with pesticides and chemicals to make it rot resistant, ICFs are naturally mold-proof. Dade hurricane-resistant standards should be able to withstand more than 90% of tornadoes. These upgrades are relatively inexpensive. On a typical ICF home, the difference between an ordinary roof and a storm-resistant one is $500 to $1000 of straps, hurricane ties, and anchor bolts. He states that by tying the concrete walls and roof into a single steel-reinforced box, the structure will survive virtually any natural disaster. This type of concrete home construction has a proven track record going back more than half a century on the island of Guam. There, thousands of these homes have withstood repeated severe disasters, such as an 8.1-Richter scale earthquake in 1993 and typhoon Paka in 1997, which hit Guam with wind gust velocities in excess of 240 mph. Incredibly, there is no record of structural damage to any of the concrete shell homes from either of these mega-disasters. Here on the U.S. mainland, and in Canada, concrete roofs are only rarely seen. Another alternative for storm safety is a safe room within the house. For instance, our roof does have hurricane ties, but we also have a concrete walled root cellar with concrete ceiling in case of truly severe weather. You can learn more about safe rooms here. Can one assume that an ICF type home would be perfect on the East Coast of South Florida close to the beach? What type of foundation process would work best? Were thinking of Building A home about a 1/4 mile from the Ocean. ICF has been successfully used in hurricane prone areas, including Florida, for some time. As for the foundation, I’d suggest working with a local builder to design something appropriate for conditions. I’m not familiar with water table levels and underlying geology in that area.